Trust Defender to make thieves and vandals think twice about approaching your property. 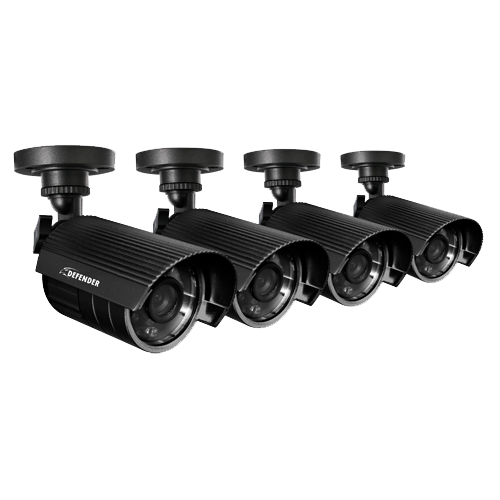 Our all-weather cameras deliver clear, high-quality video with 480TVL. 24IR LEDs allow for 75ft of automatic night vision. Anti-vandal mount ensures cameras cannot be tampered with and 65ft of cable allows for greater flexibility in mounting around your home or business. Don’t give thieves a chance. Stop them with Defender! Your security system is only worthwhile if you can actually see the person stealing from you. Defender cameras are equipped with 480 TV lines of resolution. The resulting clear, crisp and accurate video feed will help put the criminal away. The things that go bump in the night are sometimes a thief making off with your big-screen TV. Defender cameras are equipped with night vision that automatically activates. Twenty-four infrared ClearVu® LEDs provide crisp and detailed night imagery as you monitor from up to 75 feet away, even in complete darkness. So thieves may think they’re lurking in the dark but you can rest assured Defender will see them. Thieves know dismantling a security system is a good way to get off scot free. But they’ll be disappointed with DEFENDER®. Each camera’s cable runs through the cable mount and then directly into the wall, leaving no part of the cable exposed. Your footage will be secure. 4 Outdoor security cameras, 65ft cable, power adapter, four-to-one port power supply for cameras, mounting hardware, quick start guide, 1 year manufacturer's direct warranty. great clarity. So very easy to install. I cannot tell you what a secure feeling I have after getting this security system. Thank you so very much for such a secure peace of mind!! !